Reeses Peanut Butter Cups are big cups of a mix of chocolate and peanut butter. 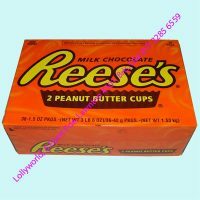 This reminds of the Family Guy episode where Captain Reeses invented peanut butter cups. There are two cups in each packet.